Posted: Sunday, August 19, 2018. 9:17 pm CST. 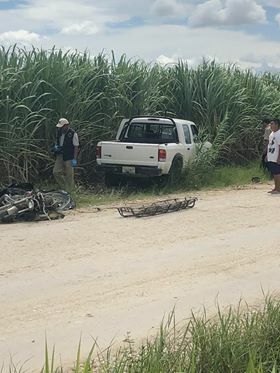 By BBN Staff: Orange Walk police are investigating a road traffic accident that claimed the lives of two people today. The accident occurred on the San Juan Road around 12 p.m. today. A motorcycle and a white ford ranger pickup collided resulting in the death of the two persons. Breaking Belize News will have more details when a police report is issued.